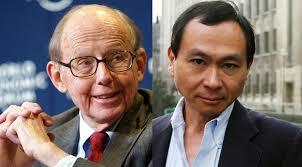 Fukuyama, Huntington or neither one? After the implosion of Soviet Union and the formal ending of the Cold War, Huntington (“The Clash of civilizations?”, Foreign Affairs, 1992) and Fukuyama (“The End of History and the Last Man”, Free Press, 1992) became the two most debated theorists for the future of world order. One arguing for a clash among cultures (more than ideologies or economies as in the past) and the other on the end not only of clashes but of history, with the advent of Western liberal democracies as the “final form of human government”: the ultimate stage of the human evolution, in a ‘progressive universal history’ view. While Huntington could be considered a pessimist in the depiction of future world order, Fukuyama is an optimist that foresee the triumph of the Western liberal system because political evolution is no longer possible. Like Hegel and Marx he follows a linear view of historical evolution, not a cyclical one like realists. He believes that conflict and crisis will still occur, in particular in the Third World and between ‘historical’ (that follow the struggle and conflict) and ‘post-historical’ (that stay at peace) parts of the world (similarly to Cooper’s modern and post-modern world) but there is no ideological alternative to Western liberalism: this is the best model for political and economic organization. In the past there have been Feudalism, Theocracy, Dictatorships but finally the human desire of freedom won, with the French and American revolutions, through the social contract between people and government. Dictatorships like Communism and Fascism/Nazism were not legitimate as they were based on coercion and this finally represented their end. We can argue that both these two narratives after 25 years have some validity but also limits. The first, even if may be useful in understanding the formation of regional blocks through cultural affinities, wrongly saw cultures as monoliths, and, even if for political narratives and interests this may be through, theory and history show that cultural identities are made of many layers and complexities. The “end of history” approach instead, even if able to see the evolutionary process between slavery and freedom in humankind history, failed to acknowledge that there are still many different types of governments and economies in the world today. Asian and in general Global South values are on the growth in the definition of world order, new non state actors are challenging sovereign nation states, and, most importantly, even western liberal mature democracies have to evolve today to new forms of power, rules and governance, if they want to survive and improve, answering the new modern challenges. The globalization, mutation of power and interdependence, which twenty years ago were not so evident, may change the perspectives on the end of history, postponing it a little more and making of liberal democracies something that will still survive (as some of the best systems we invented until now) but will have to be shaped too, towards more equality in the future and new evolved forms (given the crisis of democracy today both in fledgling and mature democracies). As nothing is eternal in IR the risk for nation states and democracies could be fragmentation and polarization. Plato for example, in its ‘five regimes’, suggested that after democracy some form of autocracy or tyranny will arrive, as the longing for freedom create chaos and the power must be seized to maintain order (and with the advent of Internet for example, the Big Brother society seems a not so impossible perspective for the future). But I believe that empowerment of people will keep going, at the end of the day first civilizations were based on slavery and today even if poverty is not eradicated yet, social classes started to disappear in the most advanced societies. But this doesn’t mean that history ended as without evolution there is no such thing as survival for the experiment of humankind: humankind is bound to keep evolving and diversity and conflict are the biological and philosophical bases of evolution. The fact that we are still here as a species demonstrates that humankind has an inner drive for survival and evolution that cannot be stopped. Even Fukuyama, at the end, believes that “perhaps this very prospect of centuries of boredom at the end of history will serve to get history started once again”(Fukuyama, The National Interest, Summer 1989) and also Hegel knew that repetitions were part of history when he said: “What experience and history teach is this — that nations and governments have never learned anything from history, or acted upon any lessons they might have drawn from it” (Lectures on the Philosophy of History, 1832, p. 22). So, luckily, I think that there is still time for history to unfold, as also Fukuyama said in a more recent (2012) article on Foreign Affairs about “The future of history”. Very well written, short but concise! It nicely ties things together and is a good introductory text for students beginning to be acquainted with the topic/debate!